Amsterdam Airport Schiphol (Luchthaven Schiphol) is the Netherlands' main international airport, located southwest of Amsterdam, in the municipality of Haarlemmermeer. 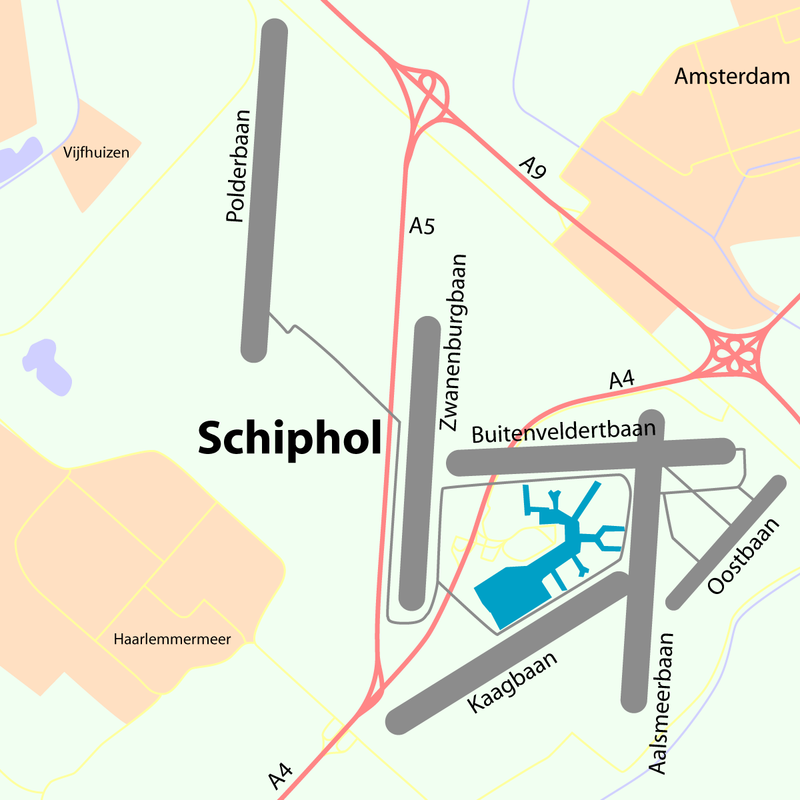 Schiphol is geographically one of the world's lowest major commercial airports. The entire airport is below sea level; the lowest point sits at 3.4 m below sea level, the runways are around 3 metres below Dutch Normaal Amsterdams Peil (NAP). 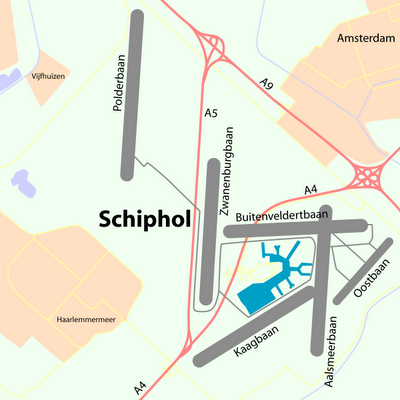 Schiphol has six runways, one of which is used mainly by general aviation aircraft. 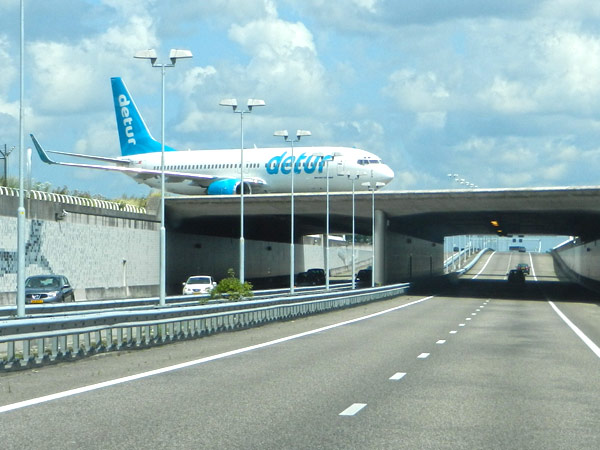 The northern end of the Polderbaan, the name of last runway to be constructed, is 7 km north of the control tower, causing lengthy taxi times (up to 20 min) to the terminal. Plans have been made for a seventh runway. 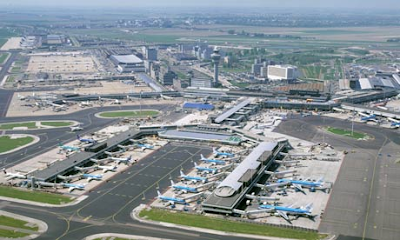 Amsterdam Airport Schiphol contributed significantly to the Dutch economy. By creating jobs, for example: at Schiphol around 62,000 people work for some 500 companies. and account for a total of 170,000 jobs in the region. The airport is the primary hub for KLM (Royal Dutch Airlines). Schiphol is KLM’s homebase. Since May 2004, Air France and KLM Royal Dutch Airlines have become the largest European airline group. The airport also serves as a European hub for Delta Air Lines and as a base for Vueling, Arkefly, Corendon Dutch Airlines and Transavia. Schiphol is an important European airport, ranking as Europe’s 4th busiest and the world's 14th busiest by total passenger traffic in 2011. It also ranks as the world’s 6th busiest by international passenger traffic and the world’s 17th largest for cargo tonnage. 43.5 million passengers passed through the airport in 2009. 45.3 million passengers passed through the airport in 2010, a 4% increase compared with 2009. 49.8 million passengers passed through the airport in 2011, a 10% increase compared with 2010). In 2009, around 67% of passengers using the airport flew to and from Europe, 12% to and from North America and around 9% to and from Asia; cargo volume was mainly between Schiphol and Asia (45%) and North America (16%). 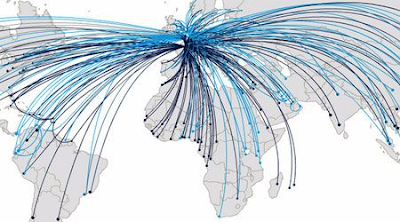 Schiphol's main competitors in terms of passenger traffic and cargo throughput are London Heathrow, Paris Charles de Gaulle, Frankfurt, Madrid, Rome Fiumicino, Istanbul, Munich, London Gatwick, Barcelona and Paris Orly.